No ski vacation is complete without a skate around a rink and Park City has two options - the rink at the base of Park City Mountain Resort and the new Park City Ice Arena at Quinn's Junction. The Park City Ice Arena sells new and used skates if you'd rather not rent. Look for "Cheap Skate" nights at the PCIA when skate rentals are included in the price of admission. 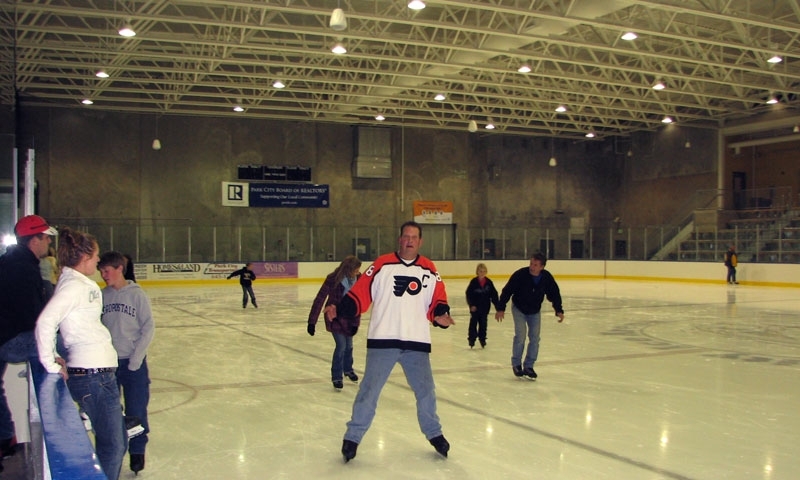 Even the indoor rink is chilly so dress in layers, bring gloves and a hat (or a helmet for kids). You don't have to throw a triple toe loop or double axle to enjoy carving up the ice on a pair of skates. In fact, ice skating just may be tops on the Park City vacation activity list... after skiing, clubbing and hottubbing. The Quinn Recreation Complex has a full-size, year-round rink known as the Park City Ice Arena where skaters and hockey players can play, practice, train and compete. It'll take you about 10 minutes to drive over to the intersection of Hwy 224 and 40, but it's worth the trek if you are more than the casual skater. The Center even has adaptive programs for sledhockey. For those looking for more of a ski vacation experience, bring your skates to the open air rink at the base of Park City Mountain Resort. The natural ice rink is open throughout the winter in the Resort Center. There is a fee even if you have your own skates and hourly rentals are available on site for those who don't have their own pair.